Finally, the fourth book of Percy Jackson series: The Battle of the Labyrinth is now available on Indonesian language. I have just bought it tonight at Toga Mas at Galeria Mall. I finally had a chance to see New Moon today with my girlfriend at Empire XXI. I bought the tickets since last Friday and gladly that i got it since i thought there were still many people who wanted to watch this movie as it just landed on Indonesia on Thursday. I haven't finished reading the book yet, so basically i didn't know the plot before. IMHO, the story can be rated as 9, but the visual effect is around 7.5. There aren't so many visual effect like the previous movie. It's stated that the period of this movie is 130 minutes, which should be 2 hours and 10 minutes. I don't think this information is accurate, since when i looked at the end time, it was only 120 minutes. In the next two weeks, my students will start their final test and that means, i have to start making the questions for them. So far, i have completed one out of three classes that i handle this semester. I'm hoping tomorrow i will get an idea for the other two classes while attending UKDW Net Club's annual meeting. I still had to make a material course for next week, so it will be a busy weekend for me, but i still have to work on it. Ganbate!!! Last day of this week, since tomorrow is a national holiday and we shall have a longer holidays, starting on Friday until Sunday. I will take this rare chance to relax my body a bit before i have to do all the marking and working on final test exams starting next week. What's your plan on your holidays? I just watched Christmas Carol today with my girlfriend at EMPIRE XXI and i was surprised to see so many people lined up to register themselves as MTIX users. Probably they have found out that having MTIX has more benefit rather than lining up in the morning while the MTIX users can just send a text message or buy tickets via online ticketing. Unfortunately, MTIX is not a perfect solution, as it's not too reliable, mostly when several new and famous movies comes out in the same time, just like what happened these days. There are 2012, New Moon, and Christmas Carol. When we accessed MTIX website, it couldn't process our request, thus we can't do transactions via the website. Let's just hope MTIX administrators will see this blog post and fix this problem, as it's getting so annoying to see the website goes down very often in the morning when their users are lining up to buy the tickets online. Christmas is getting closer and it's time for gift hunting. Usually we will give the best present during special time and Christmas or new year is one of the best moment to celebrate it with our boy/girlfriend. It will be an unforgettable moment if you can have a romantic dinner and you gave a special surprise to her (proposing for example). Closing to end of year also means that most people will held their wedding party as well. My friend has just got married last week and more couples are coming in and it will last until the end of this year. One of the item that you should have is jewelry, since most women likes to wear jewelries. One item that most girl wanted from their boyfriend/husband is a diamond rings. It's a symbol of a engagement and also marriage, so people would buy the best one they can afford for this kind of jewelry. There are so many rings out there, so please be sure to check out the best one that suites you and your girlfriend. What if you don't like what's being sold at the store and you have your own imagination of your future ring? No problem at all, as it's possible to create your own ring. This way, you can express your imagination and creativity into your own design. Since jewelry is mostly expensive, it's a good idea to learn more about jewelry, mostly diamonds. Well, you have learn it too and what's good about it is that it's free. Come and visit the education page and start learning about diamonds, including choosing which one is perfect for you. Last night, i was attending Erika's wedding party. She was my elementary friend and we went to the same junior high school, so we have many similar friends. She invited lots of her friends (which i knew), so we met each others finally. Some people didn't change at all while others have dramatically changed. I have a chance to test Google Chrome OS, thanks to people at gdgt who have packaged an image for VMWare for Google Chrome OS. You can download the image here and the instructions for using it here. Finally i'm able to browse the Internet today with Speedy by using OpenDNS. The idea is quite simple. DNS will try to resolve an IP address of the page you are trying to search by looking at it's database. If the DNS server can't fulfill your request, it will ask another DNS server which they know and the story goes on. Normally, you get two DNS entries by your ISP, a primary and secondary DNS server. On Speedy, the entry varies across Speedy accounts since they may have lots of DNS server. One problem is that when DNS Server is not working well, then you may not be able to find the page you are looking for, unless you know exactly the IP address and type them directly at the location bar in your browser. Since they never published their DNS entries, it's better to find an alternative DNS server on the Internet. There is an OpenDNS project which can fix this problem. All you need to do is register your accounts and add their IP to your nameserver entries. After adding OpenDNS' nameserver, i can browse normally again. Thanks to them. Other option for Indonesian users is to use Nawala project. It can also be used to protect children for accessing inappropriate websites, such as websites that contains adults material. with Today, i had a DNS problem with my Speedy account. My modem can connect to Speedy, but i had some problems when browsing or connecting to Yahoo using Pidgin. The error message was related to name resolving, which is usually caused by DNS problem. Let's just hope it will be fixed soon, since i need to download my students assignments which was sent to my email. 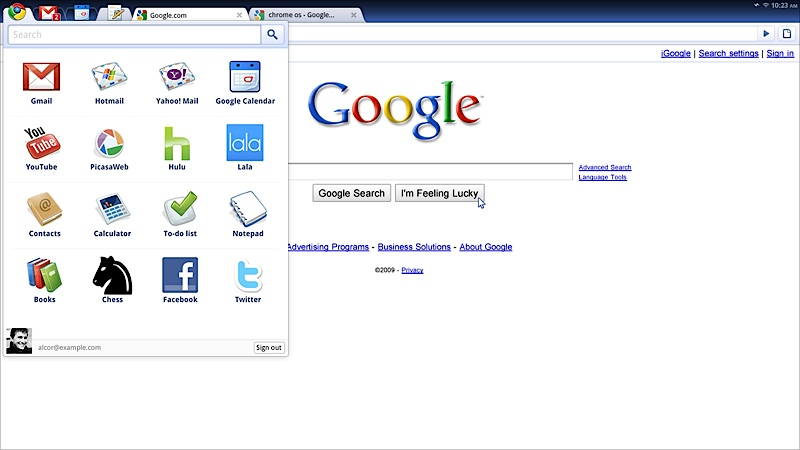 Probably the hottest news in IT world for yesterday was about the preview of Google OS. Many news site reported this and some of them came up with videos and also screenshots of the future Google OS release. GIMP Removed From Ubuntu 10.04? There has been rumors that GIMP will be removed from default package installation on the next Ubuntu release, 10.04 (and probably in the future release as well). Fedora 12 has also dropped GIMP as well. The reason for this removal is because many users doesn't seem to use it, it took too many disk space, and the interface is too complex. 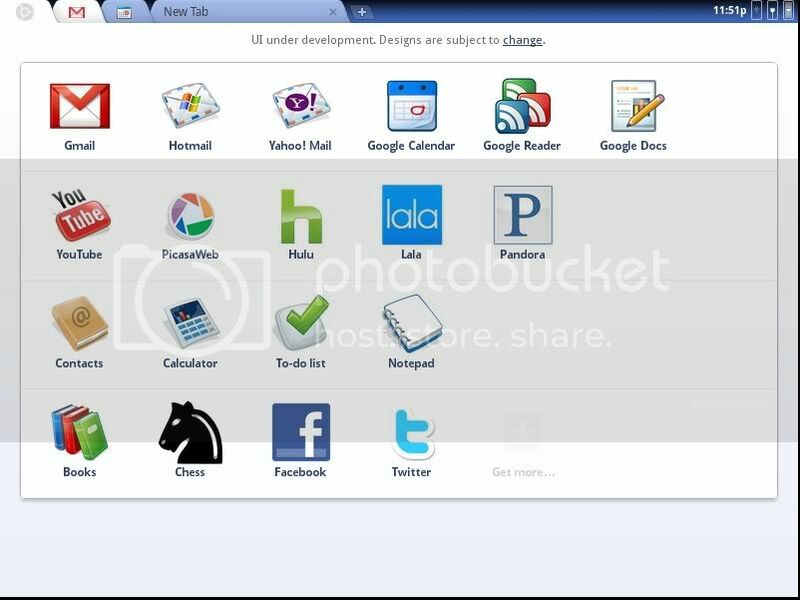 Besides, they have supplied Ubuntu with F-Spot, an alternative for photo management which takes less space, less complexity, and simpler. Fear not, since it's still available on the repository. All you need is to use apt-get to install it from the repository. I have just completed an upgrade for Indonesian Linux Forum. It's now running the latest phpBB version, 3.0.6. At the beginning, i was kinda worried, since phpBB 3.0.6 contains lots of new features and some of them are major changes compared to 3.0.5. Luckily, the upgrade process works just fine and no issues occurred during the upgrade process. Please enjoy the forum again and please post any problem on this thread. I'm sorry for some inconvenience during the upgrade process. In the next few days, i will be busy handling students who wanted to go to final presentation about their field work. The deadline for presentation registration will be on 23rd of November, which will be next Monday. Before that, they would need to get approval from their supervisors (which is me and other lecturers). There are students who followed their own schedule for this field work, but the others didn't follow their own schedule which was defined by themselves at the beginning of the semester when they made the proposal for the field work. It's a shame that they couldn't finish it this semester, because if they have followed their own schedule, they would have completed the field work this semester and continue with final project next semester. Let's just hope most of them can finish the reports and the program at the deadline due date. In less than a month, my students will face their final test and enjoy a long weekend before they start studying again on January. Many assignments have been submitted and i have took some of my time to mark those assignments before it's piling my room and my inbox. So far, most of them have done a great job and i'm quite happy with it. There are still those who didn't work out and probably abandon the class for this semester. I can't do anything about it. It's their choice, but as a grown up people, i think they should start to think more like a mature person. Yeah... i have finally experienced how it's like to teach five classes a day. I started my first class at 8.30 and followed by the second class at 10.30. My third class was on 12.30 and my forth on 15.00. My last class was in 17.30. Due to this tight schedule, i haven't got time to had lunch, so i was quite starving after i got home. Tomorrow, i will have five classes instead of three classes as usual. It's because my colleague is at Jakarta for five days training so he asked me to replace him to teach two of his classes tomorrow. Quantz is "a unique puzzle action game" developed by Gamerizon and it's likely to be released this month for Windows and Linux. It's very unique, because it's like a Zuma on a 3D platform where you have to finish all the bubbles by matching it with 4 other bubbles. Few days ago, i bought a new laptop since my previous laptop had a problem with one of the rotating pin which is used when opening/closing the lid. It's an ASUS UL80vt with good specifications. Check it on Amazon but mine is using 500 GB of hard drive instead of 320 GB listed on Amazon's site. The rest is the same. It comes with a pre-installed Windows 7 Home Premium 64 bit edition since it is equipped with 4 GB of RAM. I tried Windows 7 a little bit and i found it lighter than Vista, but some UACL annoyance is still there (even though it's less than in Vista). So i changed my habit a little bit by giving an extra project each week with only a small quota (2 students per class) and the time duration is very short (2 days at maximum). The response are quite interesting, because they compete with each others and try to do the extra project as fast as they could. Maybe i will change the teaching method, mostly the assignments for the next semester. Let's hope it will motivate them even better. Microsoft has been granted a patent for systems and/or methods are described that enable a user to elevate his or her rights. In GNU/Linux terms, it's like su/sudo. Does it mean that any next GNU/Linux distribution will be released without su or sudo to elevate their privileges to administrate the systems? Should we logged out first and logged in as root to change the systems settings? Wine development version is scheduled to be released every two weeks, but it's almost three weeks since the last release, which was on October 23. If they follow the normal biweekly schedule, it should have been released on November 6 and by tomorrow, it will be a three weeks schedule. I am not sure what took them to have one week delay on the next development release (1.1.33), but what i'm sure is that they keep working to make Wine works better with more and more Windows applications and also implementing many Windows system calls inside Wine. Rapid7 has acquired Metasploit, a project which was created to provide information on exploit techniques and to create a useful resource for exploit developers and security professionals. They are also hiring for more position. Check their blog for more information. Are you new to GIT? Then you might want to have a look on Linus' presentation about GIT on Google TechTalks. It is a live video and he gave more than one hour of presentation (1:10:14 for more precisely). Sunday is a great day to take some rest before working again on Monday, so that's what i did today, resting and relaxing myself. It seems that my body need a good rest after a full week working with so many events held. After preparing for more than three months, finally KNASTIK is now over and all the efforts are paid off. The seminar were great and the chairs were almost full (i was actually afraid that the attendance were more than we anticipated, but luckily that didn't happened). KDE 4.3.3 has just been released few days ago and today, Slackware-Current has KDE 4.3.3 packages on the -Current tree. That was quick update of Slackware-Current (as always). However, i got some problem after removing phonon package (as suggested by the Changelog). My Amarok won't play MP3 files anymore. In order to solve the problem, i re-installed Phonon package and everything worked just fine as it was to be. For now, i won't remove Phonon until there is a clear reason i should abandon Phonon and rely to gstreamer. Cancer is a leading cause of death worldwide: it accounted for 7.9 million deaths (around 13% of all deaths) in 2007. This is definitely not a good news, since every year, there has been many report about this and it's growing, meaning that more and more people died from many case of cancer. A healthy lifestyle and diet can help. Frequent consumption of fruit and vegetables and physical activity can make a difference. Early detection through screening, particularly for cervical and breast cancers, allow for prevention and successful cure. There are so many cancer type and each type will attack different part of our body. One of the example is ovarian cancer. According Wikipedia, 16090 women died from 25580 case of ovarian cancer in 2004. According to Merck Manual of Diagnosis and Therapy, Ovarian cancer is the fifth leading cause of death from cancer in women and the leading cause of death from gynecological cancer. Even though it's deadly, there has been a lot of effort to solve this problem. One of the organizations who fight for Ovarian Cancer is BioCancell by developing BC-819 and H19. For those who wanted to have a first look on the solution provided by BioCancell, please have a look on Biocancell ovarian cancer clinical trials info. It would be better to know your enemy before it attacked you, just like a good quote from Sun Tzu: If you know the enemy and know yourself you need not fear the results of a hundred battles. Even though it's not yet 2010, but Mandriva has released their latest product called Mandriva 2010. Like always, Mandriva brings you the latest update from the Open Source world into your desktop (and servers), enabling you to taste the latest development of many open source application and kernel. I was a little bit shocked when i tried to access Indonesian Linux Forum and the browser returned with a message that it couldn't find the server. Next, i tried to access the main site and i got an expired message . So this is the culprit. So, until the domain has been extended, i can't do anything about the forum. Let's hope the maintainer will fix this problem ASAP. For those who need to teach about security-related topic, such as SQL Injection, Buffer Overflow, and so on, you can try to use Foundstone's Free Tools which are available for free from their website. Every tools listed there is for Windows (sadly), but you can always use virtualization tools, such as VMWare or VirtualBox to install another OS on top of your primary OS. I tried to use the HackMe family (it consists of 4 different applications) to teach in my CEH class. Actually this is for next week class, but i decided to try it on today, so i will have more spare time next week. November started today and one thing i noticed on the first day of November is that Speedy is getting a little bit slower than it used to be. Some friends of mine has posted their complaints on several micro blogging sites, such as Plurk or Twitter. I experienced this problem also, but since i was out of home since noon and i came back at the evening, i didn't have too much problem with it. At night, when i wanted to browse some pages in the Internet, i realized the problem. No wonder my friends complaint.